xii+159pp., No. 249 of Progress in Mathematics, Birkhäuser, 2006. This book is an elementary introduction to stable maps and quantum cohomology, starting with an introduction to stable pointed curves, and culminating with a proof of the associativity of the quantum product. The viewpoint is mostly that of enumerative geometry, and the red thread of the exposition is the problem of counting rational plane curves. Kontsevich's formula is initially established in the framework of classical enumerative geometry, then as a statement about reconstruction for Gromov-Witten invariants, and finally, using generating functions, as a special case of the associativity of the quantum product. Emphasis is given throughout the exposition to examples, heuristic discussions, and simple applications of the basic tools to best convey the intuition behind the subject. The book demystifies these new quantum techniques by showing how they fit into classical algebraic geometry. Some familiarity with basic algebraic geometry and elementary intersection theory is assumed. Each chapter concludes with some historical comments and an outline of key topics and themes as a guide for further study, followed by a collection of exercises that complement the material covered and reinforce computational skills. 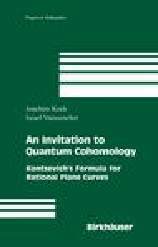 As such, the book is ideal for self-study, as a text for a mini-course in quantum cohomology, or as a special topics text in a standard course in intersection theory. The book will prove equally useful to graduate students in the classroom setting as to researchers in geometry and physics who wish to learn about the subject. this blowup results in a smooth variety. In 1.6.5 on page 41, change "had already studied such spaces already in 1968" to "had studied such spaces already in 1968"
Last updated: 2012-03-01 by Joachim Kock.